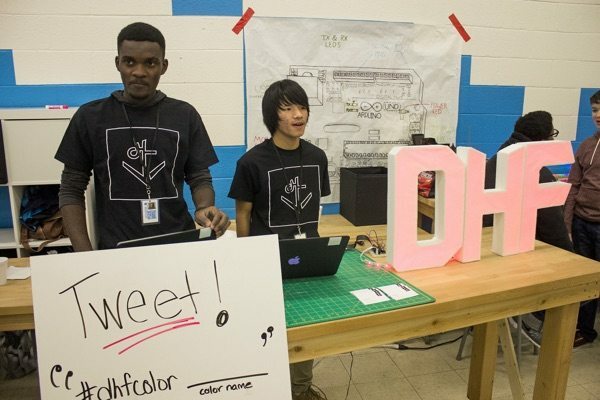 Two years ago, two of our youth, Biren and Glory, created a sign for DHF whose color could be changed using a hashtag on Twitter. Today, that project has been scaled in size, magnitude and impact as it serves as one of the center pieces at the White House #SXSL event. 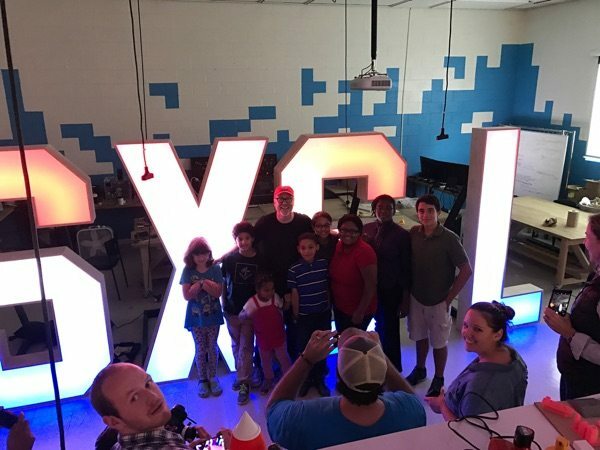 The build of the larger version letters was overseen and managed by DHF’s former Baltimore Corps Fellow, Jen Schachter, and a very special guest, ADAM SAVAGE!!! 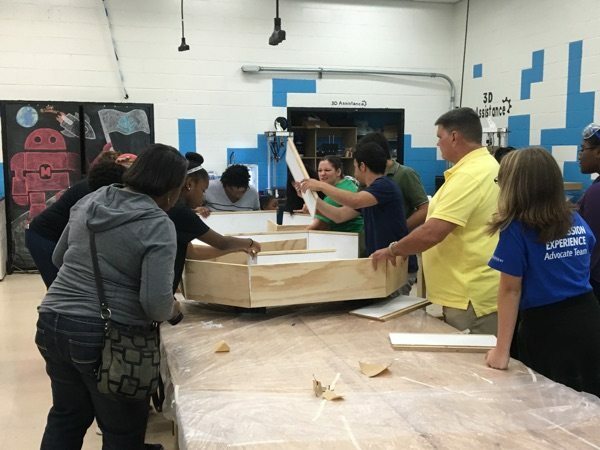 Nearly 50 of DHF’s youth and members of the educator community helped assemble the sign. Each letter contains an LED strip and an Arduino device from Adafruit. 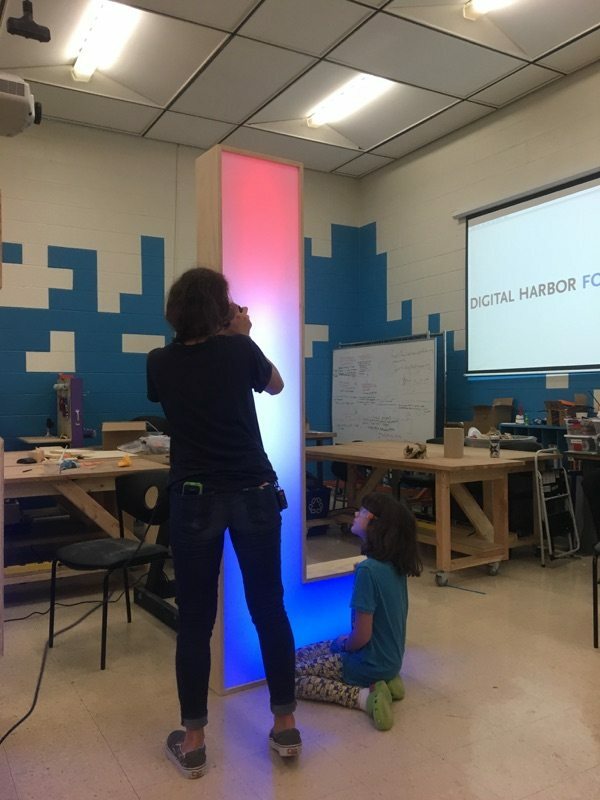 Then a Raspberry Pi crawls twitter looking for the #SXSL hashtag and looks for certain keywords to make the lights react and change color. Adam was amazing to have in the space and he was a real inspiration to our youth, not because of his celebrity status, rather because he worked right alongside of us the entire time and treating us as peers. By the end of the 10 hour build process, he was just as sweaty, dirty, and exhausted as the rest of us. Send a tweet with the hash tag #SXSL that includes any of the following words to interact with the SXSL sign.